Where do you start with Bob? He began work with Lotus in September 1960 and, apart from a short break in the early 1970s, he has been worked on Lotus racing cars ever since. Today, nearly fifty years on, he is working for Colin Chapman's son Clive at Classic Team Lotus, running and restoring many of the very same cars he worked on in period. Bob actually went for an interview with Lotus when they were based in Hornsey, North London but the pay wasn't good enough so he stayed put. He went back again after the company moved to Cheshunt and stayed with the firm when it moved to Norfolk. Moving on to the Lotus-Cortina section, by 1965 he found himself in the US supporting the English Ford Line Cortinas with Bob Sparshott and Allan McCall. 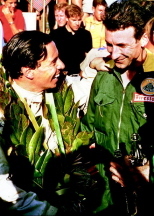 When extra manpower was needed at Indy, the two Bobs were drafted in and so were present for Jim Clark's historic victory. In 1967, he ran the works Formula 2 Lotus 48s and then stepped up to the position of Formula 1 chief mechanic for 1968 in a turbulent year which saw the deaths of Clark and Mike Spence but Graham Hill won the World Championship. After a year spent working on transmissions and the four-wheel-drive cars in 1969, he left to join the fledgling March team, being seconded to Andy Granatelli's STP outfit, which was running Mario Andretti. This was followed by a period working with Bernie Eccelstone and Herbie Blash as chief mechanic for Brabham but in 1977 he was tempted back by Chapman as things were turning around again for Lotus and he worked through the years of Andretti, Peterson, de Angelis, Mansell and Senna, staying with the team until it was wound up at the end of the 1994 season. His involvement in motor sport continued, working for Toms Toyota and then RTN, an Audi subsidiary tasked with the development of the R8C Le Mans coupe and then the Le Mans-winning Bentley coupe. When the Bentley effort was over, Bob came full circle by returning to Classic Team Lotus, where he still works three days a week.